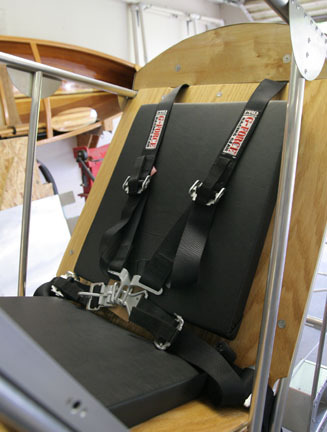 The lap belt anchors are bolted to the heavy gussets behind the seat back. Spacers were fabricated to locate the anchors far enough from the gusset to prevent the belts from being pinched. 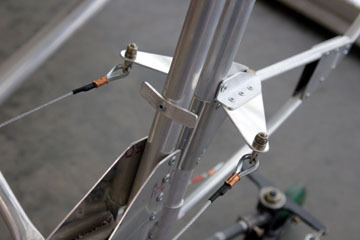 The shoulder harness is anchored to an 1/8" cable that extends to the tailpost gusset. 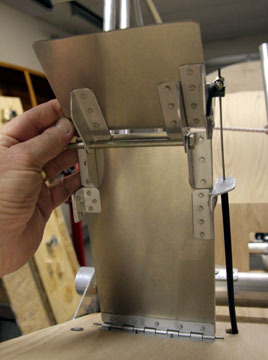 Brackets were installed to keep the cable from abrading the fuse diagonals. 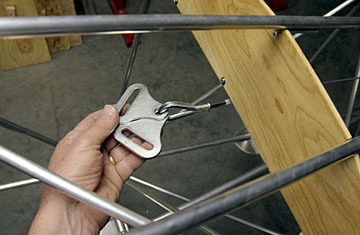 Here is the steel strap that attaches the anchor cable to the tail gusset. 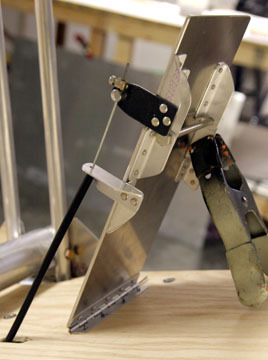 The rudder pedals are a departure from the standard kit pedals due to their construction/design and the inclusion of toe brakes. I debated whether or not to go to the effort of differential braking. A lot more work is required for individual brakes over a simple hand lever, but I decided the benefits will be worth the time spent designing and fabricating these somewhat complicated pedals. 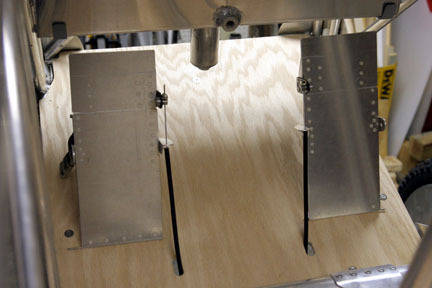 The pedals are 1/8" 6061 and 3/4" x 3/4" x 0.063" 6061 angle. 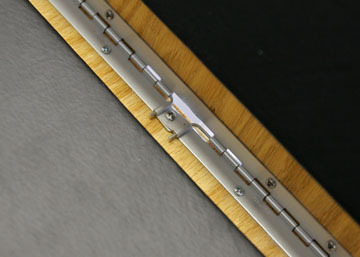 The brake pedal hinges are AN4 bolts and the whole thing is put together with a combination of flush and round-head driven rivets. 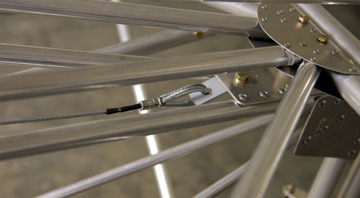 The brake cables are terminated at rotating pins to relieve stress on the cables. The pins were 3/8" bolts in an earlier life and rotate in 4130 steel arms to prevent galling (the black painted items in the photos). 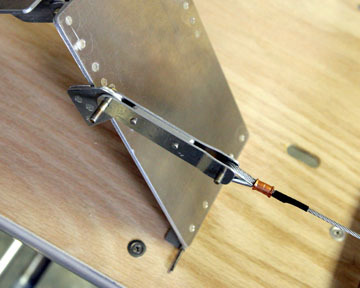 Here is another look at how the brake cable is attached to the pedal. This little project consumed many hours, but the result is a sturdy and smooth pedal that will add considerable convenience to ground handling. 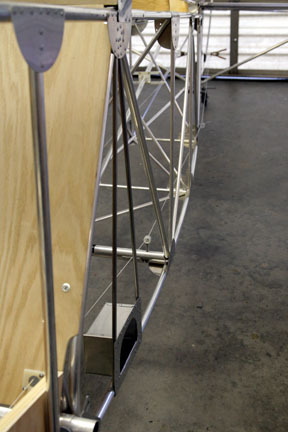 Springs will be added to hold the pedal upright after the rudder cables are installed. 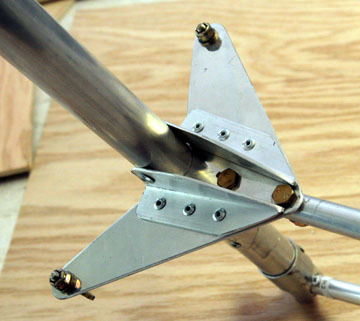 After consideration of additional forces that might be sent to the rudder due to application of both brakes, I added these angles to the rudder horn. This lightweight mod adds a lot of rigidity to the horn. It also adds surface area for application of the fabric. In spite of my best efforts, I could not find a route for the rudder cables inside the fuse that would allow a straight shot to both the rudder and tailwheel. There was always a fuse member in the way. So....it was time to think outside the box, or in this case, the fuse. You can see the string I used to test the cable routing, and the solution was a fairlead outside the fuse. 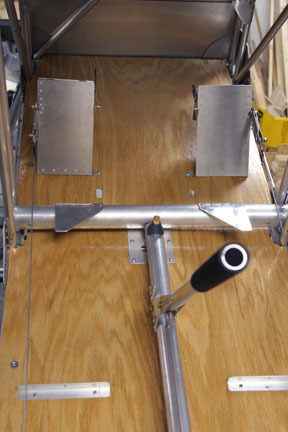 This allows a direct route for both rudder and tailwheel and keeps the total run fairly straight. 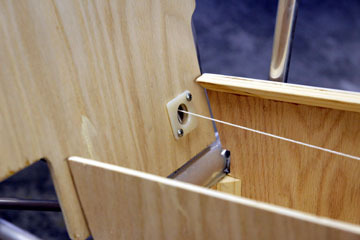 Nylon guides were made for the two passages through the seat base. I'm using standard fairleads for the aft fuse guides. 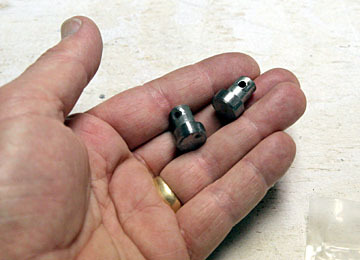 These fit into 7/8" steel 4130 tubing which in this case was welded to the head of a 1/4" bolt. The outside fairlead has to be reinstalled after the fuse is covered so it is attached via nutplates. 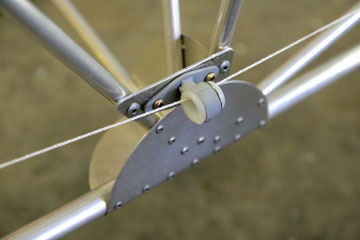 Here is how the rudder and tailwheel cables are linked. 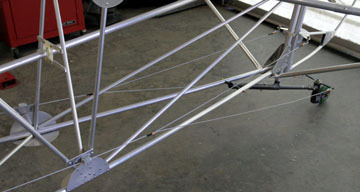 The through cable is attached to the rudder. 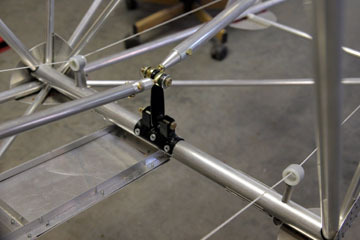 Aluminum links were fabricated to join the cables to the pedals. These can be replaced if the pedal position needs to be adjusted. This is the rudder travel stop. 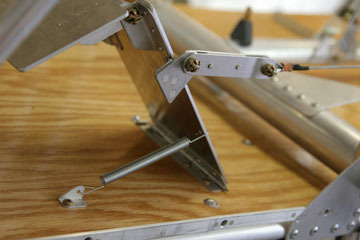 The cables are terminated in eyebolts so the cables can be removed from the rudder. This also prevents wearing out the holes in the rudder horn. Update 5/22/2017; After flying the D.VII for an hour in turbulent air with associated rigorous rowing of the stick, I decided to replace the aluminum straps with straps fabricated from 0.090" 4130 steel. The thought of one of those straps breaking in-flight prompted me to upgrade the control stick. There has been one documented instance of this type of failure. Floorboards have been finished with polyurethane varnish and controls reinstalled. 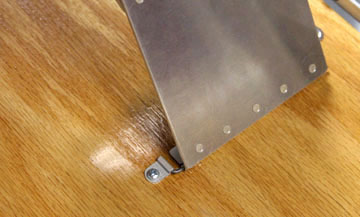 The keepers for the rudder pedal hinge pins are a single hinge eyelet secured with a sheet metal screw. 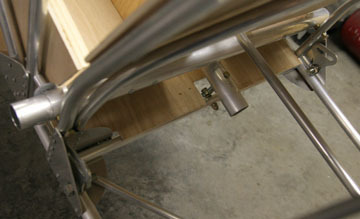 Detail of the pedal return spring. The challenge of selecting a spring is finding one that will stretch enough to allow full pedal travel without being damaged. This spring was found in the aeronautical department of the local Lowes and works perfectly. Deciding on a plan for the seat has been a decision process that has been ongoing for many weeks. I've been through several scenarios--an aluminum auto racing seat, a plastic boat seat, and something made out of wood that looked semi period correct. But all those options had issues I couldn't resolve, either dimensional or aesthetic. I decided to build something functional to get the plane in the air but give me the option of changing later. Here are the seat and back rest bases. Two layers of Walmart sleeping bag pad were attached to a plywood base with contact cement. 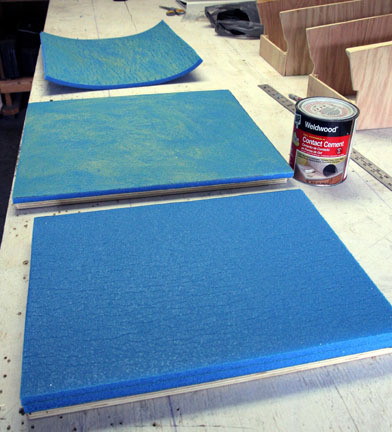 This foam is dense, almost like memory foam but a fraction of the cost and weight. The foam is covered with black vinyl procured in the aircraft upholstery department of the local Walmart. 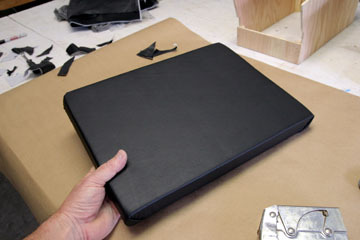 This material is flexible enough to stretch around the foam and lap quite nicely at the corners. 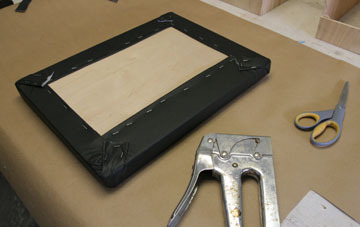 1/4" staples secure the vinyl to the ply base. Not bad considering I know absolutely nothing about upholstery. If the vinyl doesn't hold up I can take the foam bases to a real upholstery shop for something nicer. Pretty sure the guys flying Fokkers a hundred years ago didn't have anything that looks like this. But it should be comfortable enough to run the fuel tank down to reserves. Harness is G-Force race car set with latch-link buckle. 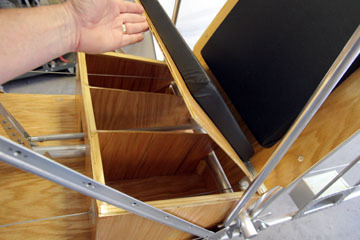 The seat base is hinged for access to two storage compartments. 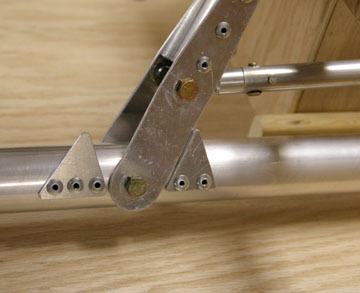 In order to allow the seat base to be removed from the finished aircraft, the hinge pins are split in the middle and secured with two hinge eyelets.